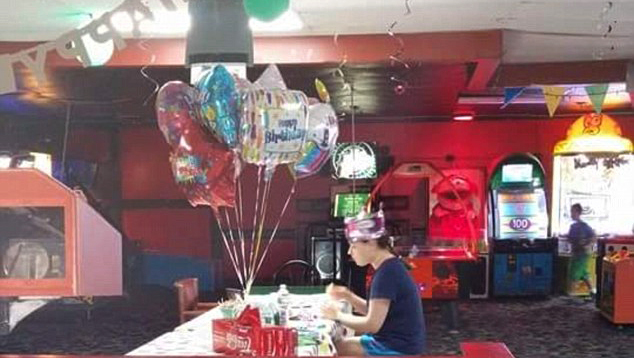 PORTLAND, Maine - Hallee Sorenson sat despondently in a bowling alley, flanked by balloons and streamers, at her 18th birthday party after no one came. Her cousin wants to make things right for her this year. Rebecca Guildford, of Oxford, Massachusetts, said that Sorenson, who is autistic, deserves a big celebration for her 19th birthday next month, so she posted the party picture of Sorenson on Facebook. "This would mean a lot to her mother as well, for as you can imagine, watching your child cry into her birthday cake breaks your heart," Guildford wrote. "If there is anyone who deserves a great birthday, this is the girl." Sorenson lives in Bangor, Maine. Guildford asked people to "flood her mailbox" with birthday cards and letters, and included an address in the Facebook post. The 33-year-old police dispatch operator posted Tuesday and has generated news coverage as far away as Australia, as well as an outpouring of sympathy for the young woman. The post had been shared more than 150,000 times on the social media website by Friday afternoon. Guildford said many people have asked if they can also send gifts. She said it's not necessary but her cousin does love puzzles, baby dolls, costume jewelry and anything related to zoo animals. "She's going to see that a lot of people want to be her friend and want to wish her well," Guildford said in a phone interview Friday. Sorenson wanted to go bowling and eat cake and ice cream for her birthday last year; the family sent invitations to her classmates and friends, Guildford said. Sorenson sat anxiously awaiting their arrival, but no one showed up, she said. Plans for a bigger, private birthday party with family next month are in the works.